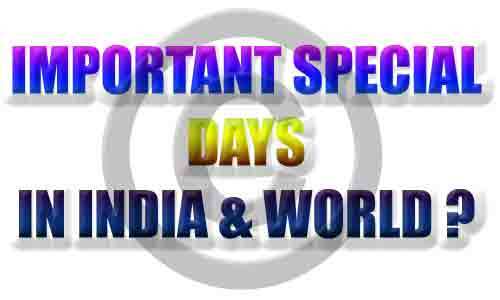 Here is a huge collection of National and International Important days of the year. This will help you find the important dates and days of India and the World of whole year. In many competitive exams like SSC, IBPS, SBI, RBI etc., the questions related to days are asked. This list of important days will let you know what is that day for. This list will held you clear the questions related to what is on that day. In the general awareness section of these exams, at least one question is definitely asked on important dates / days. So in order to prepare better, you need to remember this list of Important dates / days of the year. This list will help you learn about Important days of both National and Internation i.e. India and World. January 01 : Global family day. January 09 : NRI Day. January 10 : World laughter day. January 12 : National Youth Day. January 26 : International Customs day. February 12 : World day of the sick. February 24 : Central Excise Day. February 28 : National Science Day. March 4 : World day of fight against sexual exploitation, National Security day. March 15 : World consumer right day. March 20 : World day of theatre for children and young people. March 21 : World Forestry Day. March 21 :International Day for the Elimination of Racial Discrimination. March 23 :World Meteorological Day. April 5 : National Maritime Day. April 7 :World Health Day. April 18 :World Heritage Day. May 3 :Press Freedom Day. May 8 :World Red Cross Day. May 11 : National Technology Day. May 15 : International Day of the Family. June 4 :International Day of Innocent Children Victims of Aggression. June 5 : World Environment Day. June(2nd Sunday) : Father’s Day. June 20 : World Refugee day. June 21 : Father's day, World Music day. June 26 : International day against Drug abuse & Illicit Trafficking. June 27 : World Diabetes Day. July 1 : National Doctor’s day. July 6 :World Zoonosis Day. July 11 : World Population Day. August 2 : International Friendship Day. August 9 :Quit India Day and Nagasaki Day. August 29 : National Sports Day. September 8 :World Literacy Day. September 26 : Day of the Deaf. September 27 : World Tourism Day. October 4 :World Animal Welfare Day. October 5 : World Teacher’s day. October 8 : Indian Air Force Day. October 9 : World Post Office day. October 10 : National Post Day. October 12 : World Arthritis day. October 13 :UN International Day for National disaster reduction. October 14 :World Standards Day. October 16 : World Food Day. October 17 : International day for the eradication of poverty. October 24 : UN Day, World development information Day. October 30 :World Thrift Day. November 5 : World Radiography day. November 18 : World Adult day. November 19 : World Citizen day. November 20 : Africa Industrialization Day, Universal children day. November 21 : World Television day, World Fisheries day. November 25 : World Non-veg day. November 29 : International Day of Solidarity with Palestinian People. November 30 : Flag day. December 1 : World Aids Day. December 4 : Navy Day. December 5 : International volunteer day for economic and social development. December 7 :Armed Forces Flag Day, International civil aviation day. December 9 : The International day against corruption. December 10 :Human Right Day. December 11 : International Mountain day. December 14 : International Energy day. December 18 : International Migrants day. December 19 : Goa’s liberation day. December 20 : International Human solidarity. December 23 :Kisan Divas Farmer's Day). So this is the collection of Important days and dates of whole year for India and the World.